Having spent the winter off the farm, Gregg has discovered "Urban Light", urbanscapes. The clock doesn't begin and end with the sun coming up and going down. Street lights, porch lights, neon lights, the moon the stars, cold light, warm light, reflected lights and more makes painting at night a new adventure for a plein air painter. Much of the body of this new work are of the Capitol which towers over the landscape. Having been elected to public office myself and a wife that works the legislature during session, I find the landscape of the capitol to be an endless subject both for landscapes and studio work. Whether it's the cheery blossoms or 'dark suits' in the galleries of the legislature, I find endless novel perspectives to share in my work. Luv to see you. 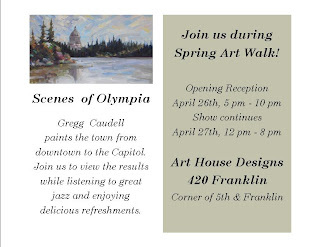 Come enjoy the refreshments, art and music.